FEUD: YOU MEAN ALL THIS TIME WE COULD HAVE BEEN FRIENDS? Feud is a tragedy. Not in terms of production, for it's a well-created, well-crafted limited series. 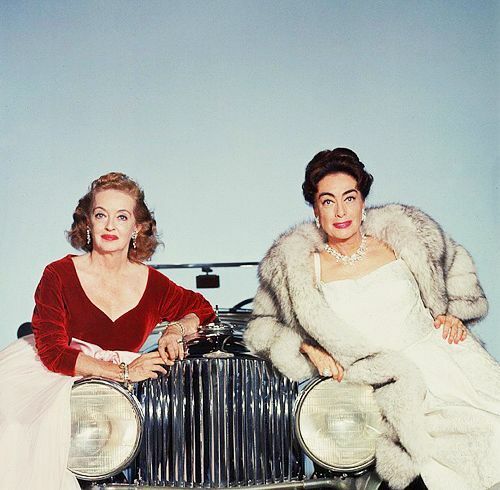 Instead, it's a tragedy in that we see how Joan Crawford and Bette Davis, at the center of the first season, ended: sad, relatively lonely, and with little to show for their decades-long rivalry. You Mean All This Time We Could Have Been Friends? wraps up this sad and sordid story of these two divas, who hopefully will be remembered more for their work onscreen than their wickedness off screen. The episode, longer than most, first goes into chronicling Joan Crawford (Jessica Lange). Facing serious health issues (including deteriorating teeth due to surgery to further her career), Crawford keeps drinking as she suffers from the poorly-funded filming of Trog, her final film. She is genuinely appalled at how low the production is, and isn't too thrilled whenever people ask her about What Ever Happened to Baby Jane?, even when promoting her lifestyle book. In a lengthy sequence, as she slips into hallucinations in the final week of her life due to cancer, she imagines a lavish yet intimate dinner party with her frenemy Hedda Hopper (Judy Davis), her difficult boss Jack Warner (Stanley Tucci), and even Bette Davis (Susan Sarandon). While everyone there bemoans how low Hollywood has gotten, the two bitter rivals at this dinner appear to finally bury the hatchet, but not for long, as Mamacita (Jackie Hoffman), who has returned on a part-time basis, leads the disoriented Crawford back to bed, and in essence, to eternity. Davis' career isn't going well either, having appeared in a series of failed pilots. Her old friend Victor Buono (Dominic Burgess) tells Davis that Crawford is dying and urges her to make peace, telling her that Crawford is the only one who knows what Davis is going through. He further points out that both have had parallel lives: struggles in their careers, ungrateful children. Davis does call Crawford, but cannot bring herself to speak. We finally go back to the Academy Awards of 1978, which have been the framework for Feud. We learn that all these interviews of people like Joan Blondell (Kathy Bates) and Olivia de Havilland (Catherine Zeta-Jones) were for a documentary, one that Davis stubbornly will not participate in. They, along with Pauline Jamison (Alison Wright), the assistant who found new life working on documentaries, watch the In Memoriam of the Oscars. Blondell notes sadly that fifty years career were reduced to two seconds as Crawford's photograph is included in the montage. We end with speculation about the first day's shooting of What Ever Happened to Baby Jane?, and we see that Crawford and Davis actually got along quite well, laughing like two old chums, before they head out to their separate dressing rooms. Another montage tells us of the real people involved in this Feud. The episode I think gets why this story is a tragedy, particularly for Crawford. We see the indignities she went through with Trog, her final film, how bad pictures of her and her friend Rosalind Russell made her a recluse, how the stories in her daughter Christina's book Mommie Dearest privately devastated her, and how she died a lonely woman. For Davis, we see how she kept working but in projects that did not fit her talent, how one of her few rivals (Katherine Hepburn) rejected her (in essence inflicting the same haughtiness on her that she inflicted on Crawford), and how her own daughter ended up rejecting her. A scene between Davis and her daughter B.D. Hyman (Kiernan Shipka) reveals the resentment the latter had and how she disapproved of her mother as both mother and daughter. The coldness Hyman has would be a preview of the devastating turn of events when Hyman wrote her own memoir, My Mother's Keeper. However, unlike Crawford, who died before Mommie Dearest was published but was aware of its contents, Davis was very much alive when My Mother's Keeper came out (though disabled by a series of strokes and recovering from cancer). Davis never again spoke to her daughter. Despite all their hatred, the two did indeed have parallel lives. There is a sense of tragedy in You Mean All This Time We Could Have Been Friends?, and the double meaning of the title (a line from What Ever Happened to Baby Jane?) rings true. The tragedy runs throughout the episode, from Mamacita's sad observation that people came when Crawford died but not when she needed them to Davis' discovery of someone she ended up hating more: Faye Dunaway, whom she worked with in a television movie and found more intolerable than Crawford (who at least was always professional on the set). The fact that Crawford had praised Dunaway and said she would be the only person who could play Crawford probably made things more maddening for Davis. While the episode slips into fantasy (the extended dinner sequence and the first day shooting scene, the latter still a point of debate about its reality), it does draw you in. We are aware that the whole thing is in Crawford's head, but knowing that she is days from death makes the whole scene, where the mixture of bitterness and elegance brings them a sense of peace. Crawford in her dementia is allowed a moment of bliss and catharsis, and that seems poignant. Davis talks about losing her 'high standards' in order to keep working, but fortunately Feud didn't. Even in their smaller roles, Davis and Tucci were wonderful as the acid-tongued Hopper and the unapologetic Warner. In her one scene, Shipka was cold and effective as B.D., forever angry. As for the two leads, You Mean All This Time We Could Have Been Friends? is more Lange's hour-plus as the dying Crawford. While I question just how unhappy she was in making Trog (by all accounts, she was aware it was bad but remained the professional), Lange made Crawford a person, hurt and lonely, desperate to hold on to the one thing that gave her reason to live: her career. Even if it cost her a set of teeth or suffered indignity upon indignity, Lange's Crawford kept going, rarely letting cracks appear. When they did, like when her daughter Cathy (Audrey Moore) comes to visit with her own children, we see the vulnerability and pain of her final years. Sarandon keeps that haughty demeanor to her Davis, but she also has regrets, particularly when she cannot bring herself to speak on the phone with Crawford. The bitterness will not go away, and it makes it again, all the more tragic. Again, sometimes the musical choices are a little too on the nose (playing The Doors' The End as Crawford films Trog is a bit too much), and proves a bit distracting. I also question whether the episode had to be as long as it was. However, these are minor complaints. As an elegy to Crawford and Davis, to the end of their Hollywood, and to how Hollywood as an industry still can't do right with women (especially of a certain age), we see the present reflected in the past. You Mean All This Time We Could Have Been Friends? Yes, they could have, but chose not to.